This entry was posted on March 20, 2013 by admin. 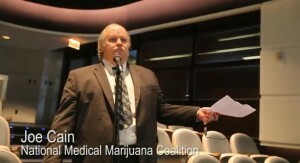 Joe Cain of the National Medical Marijuana Coalition testified in favor of approving cannabis to treat PTSD. The Michigan Department of Licensing and Regulatory Affairs.is charged with making the final decision about whether to approve Parkinson's Disease and PTSD for treatment with medical marijuana under Michigan law. Their initial finding was to approve Parkinson's but reject PTSD. This video was taken at a hearing held by the Bureau of Health Services at the State of Michigan Library to allow public comment. A final decision is expected in May, 180 days after the initial filing. Cain and others talked about how medical marijuana offers the hope of reducing the 18 suicides a day among military personnel.